In this revealing memoir, Frank Zeidler reflects on his victories and losses during his tenure as mayor of Milwaukee from 1948 to 1960. Although the era was marked by Cold War tensions and McCarthyism, Frank Zeidler held fast to his Socialist ideals and was re-elected mayor each time he campaigned. He was the last Socialist mayor of a major American city. 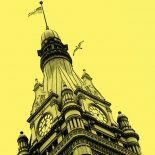 During his three terms as mayor, Frank Zeidler played a pivotal role in Milwaukee’s growth, more than doubling the land area of the city while fighting the forces of suburban sprawl. At the same time, he succeeded in advancing the tradition of honest and efficient government established by Milwaukee Socialists in the first half of the century. In writing of his past service, Frank Zeidler explores issues that are still relevant today. Can vital services and resources be shared fairly among vastly different communities? Can governments find new ways to put aside conflicts and achieve genuine cooperation? Can third party candidates position themselves to win public office, and if so, can they provide effective leadership without the support of a powerful party machine? Can government be kept free of graft and corruption? Can the public interest be served if government hears only the voices of powerful special interest groups while ignoring the needs of individuals who are too weak to have a voice? As mayor, Frank Zeidler was widely respected and highly regarded, even by people who disagreed with his political philosophy. His reputation as a man of compassion and integrity has continued to grow over the years. Many people today regard him as Milwaukee’s best mayor. A Liberal in City Government is the political testament of a singular figure in modern American history. As Milwaukee’s mayor for twelve years and its leading citizen-statesman ever since, Frank Zeidler earned broad respect for his integrity, his vision, and unwavering commitment to his Socialist ideals. This book, written from the intersection of principles and politics, sheds light on a formative period in our nation’s urban history – the years just after World War II, – but it is even more compelling as the record of a man who never stopped trying to lift the society around him to higher levels of justice and compassion.